China is ready to localize semiconductors such as non-memory, DRAM, and NAND flash. Its goal is to change 200 billion dollars worth of imports, which is about two-third of world’s semiconductor market size (300 billion dollars), into domestic products. Semiconductors are large-scaled singular import item that exceeds oil import in China. Excluding memory such as DRAM and NAND flash, China built fabless market which the size of it is number 3 in the world. While China recorded 9% of shares last year, Korea only recorded 1%. 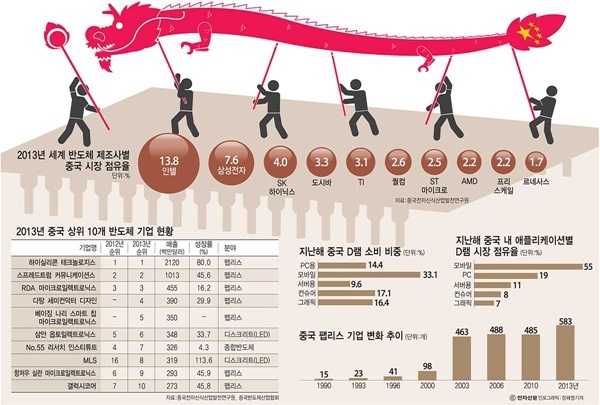 China is receiving appraisal that it had already surpassed Korea in technical skills and its ambition now is to compete against U.S. after surpassing Taiwan, which has many fabless competitors. China primarily wants to localize DRAM semiconductors to meets its domestic demand, but its ultimate goal in long-term is to enter top echelon of World’s DRAM market. Starting late 1990s, China pushed for the development of all areas such as semiconductor design, production, and application step by step. Under the strategy that makes Chang Jiang Delta, which is comprised of Shanghai, Jiangsu, and Zhejiang, centered for semiconductor industry, China prepared step-by-step development ways by 2010 such as accumulated complex. It also set out a plan to expand semiconductor industry such as semiconductor package and test to front-end development by 2015 when it is at back-end development. Chinese government then set Taiwan as a target for its technology standard. It hoped to localize half of integrated circuit’s (IC) demand and 80% of its demand by 2020. It also hoped to develop its semiconductor production base as number 3 in the world, and its bigger picture is to promote its industry that can be compared to Silicon Valley. Afterwards Chinese government focused on reorganizing industrial structure centered around ‘Zhongguancun Nationally Independent Innovating Testing Borough’ so called Chinese Silicon Valley. It announced ‘Guideline for Developing Chinese IC Industry’ in June of 2014 and made a goal for this year’s industry sale as 61 billion dollars. It also prepared a steppingstone to invest in industry related to semiconductors by speeding up international merger and acquisition process through makings of ‘Chinese National Integrated Circuit Industrial Investment Fund’. Semiconductor industry developed rapidly under the Chinese government’s support that was systematic and step-by-step. According to CCID, Chinese fabless businesses grew from 15 in 1990 to 98 in 2000 to 485 in 2010, and to 583 in 2013. Top 10 Chinese fabless businesses in 2014 sold 43% (56 billion dollars) of Chinese sales, which indicates that they developed into huge businesses. According to market investigation enterprise ‘IC Insights’, only Hisilicon, which is an affiliated company of Huawei, was in top 50 in the world in 2009. But in 2014, 9 Chinese businesses including Spreadtrum, Datang, Nari Smart Chip, CIDC, Rockchip, RDA, Allwinner, and etc were in top 50. Spreadtrum is an example that grew rapidly under the Chinese government enterprise ‘Tsinghua Group’ after it took over Spreadtrum in 2013 and gave Spreadtrum full support. Foundry also developed along with system semiconductor. By the help of fast-growing manufacturing firms such as Huawei, Lenovo, Haier, TLC, and etc., system semiconductors and foundry were able to be developed together. Foundry business called SMIC gets 45% of its sales from domestic demand. Although SMIC’s main customers are China and the U.S., its growth potential is plentiful since Chinese domestic market is growing rapidly. SMIC is also closing on competitors in technical skills. SMIC’s goal this year is to mass-produce 28-nano process in Beijing and Shanghai. Its other goals this year include differentiated technical development, operation of new fabless, and findings of new partners in China and other countries. To develop DRAM production business, Chinese government is looking at 6 local governments to build DRAM fabless. Beijing, Shanghai, Hefei, Wuhan, and two other cities are competing to attract the construction of DRAM fabless. When DRAM fabless is built in the chosen city, there will be a huge industrial complex because an industrial ecosystem will be developed due to semiconductor design, equipments, and materials. Chinese system semiconductor industry was able to develop because many talented people studied abroad and came back to experience semiconductor industry at a Chinese business. It is known that there are lesser talented people in memory field since it puts importance on processing skill that produces actual chip and it has higher level of difficulty than system semiconductor. It is shown recently that China is investing nonstop in securing world’s best technology whether it’s memory or non-memory. Earlier this month, Chinese private equity fund consortium announced that it will buy Omnivision, which is number 2 CIS company in the world, for 1.9 billion dollars. This is the result of rise of importance in high-pixel image technique in cars, security, and IoT, and not just in Smartphones. By buying omnivision, it is able to compete against Sony and Samsung Electronics who are number 1 and 3 respectively. It is also active in securing memory technical skills that it lacks. It took a step forward in DRAM industry by making a private equity fund to buy ISSI, which designs mobile DRAM, SD RAM, Analog semiconductor, and etc., for 640 million dollars. Korea was able to take over Fidelix that designs memory for special use such as S RAM. As demand for small amount of memory is increasing in many fields such as IoT, it is a field that China definitely wants to get their hands on since they are actively trying to secure many technologies as possible. Attracting investments from global enterprises is becoming active, and Intel is a prime example. Intel announced last year that it will invest 1.6 billion dollars for 15 years hereafter in Chengdu, which is Chinese main production base for IT equipments. Its goal is to upgrade facilities in Chengdu completely and introduce high-tech technical skills to operate in late next year. It also made an alliance with Rockchip to increase the shares in low-price application processor (AP) for tablets. Qualcomm is looking to increase its share by building a strong cooperative system with Chinese businesses. It is preparing to produce 28-nano process based AP by forming an alliance with SMIC. XMC, foundry business that holds 300 mm fabless technology, is cooperating with Spansion to develop 3D-NAND technology to mass-produce in 2017.